A Valentine's Day treat from 12-year-old homeschooler, Angelica! 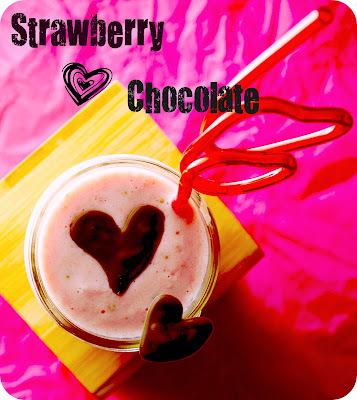 Strawberries + Chocolate = Valentine Smoothies! These smoothies are easy, sweet and colorful! Adding small chocolate hearts only make them cuter, don’t ya think? Use frozen fruit instead of ice to boost the nutritional value, thicken the smoothie naturally and avoid using sugar. Place all ingredients in blender (except chocolate). Blend until smooth. Place chocolate chips in a microwave-safe bowl. Microwave in 30-second intervals until chocolate is melted. Use spoon to make hearts on parchment paper. Refrigerate until ready to garnish your smoothie. Angelica is a 12-year-old homeschooler with dreams of becoming a pastry chef.